All those born in October should consider themselves lucky for having a tourmaline birthstone, alongside opal. One of the most colorful semi-precious stones, tourmaline is actually a compound of minerals. This leads to a plethora of colors displayed by this gem. It also makes it ideal to use for its healing properties. Tourmaline birthstones are associated with the Libra sign of the zodiac, which corresponds to the month of October. This means that their energetic powers aid in relieving any spiritual blockage this sign might encounter. Since tourmaline has magnetic powers, it will help cleanse and recharge your system with electromagnetic energy. This forceful gemstone will repel any stress or disturbance from your life, but also help you achieve a state of serenity and lucidity. The name of the tourmaline birthstone comes from the word ‘Turmali’ or ‘Thoramalli’, which is used in Sri Lanka to designate various semi-precious stones. The word ‘Turmali’ can be translated as ‘stone with mixed colors’, reflecting the wide array of nuances that are displayed by this gem. Tourmaline varieties, however, are known by many names such as elbaite, indicolite, rubellite or schorl. Tourmalines first arrived in Europe through the Dutch East India Company at a time when there was a great interest in any exotic gem. Since then, tourmalines have been found on the territory of the United States, Brazil, Afghanistan, and throughout the African continent. Because of its magnetic properties, tourmaline was also known as the ‘Ceylonese Magnet’. There are many legends and popular beliefs surrounding the wide array of colors displayed by the tourmaline birthstone. An ancient Egyptian legend holds that this gemstone had to travel all the way from the center of the Earth to reach the surface. On its journey, tourmaline traversed a magnificent rainbow and, as a result, acquired all its nuances and hues. Other stories mention its colorful features as a cause for confusion. Because tourmaline is so similar to many precious and semi-precious stones, it can easily be confused with a ruby or an emerald. The 17th Century jewels of the Russian Crown are in fact tourmalines and not rubies. The same can be said for many of the emeralds sent to Portugal during the colonization of Brazil. The best way of utilizing the powers of the tourmaline gemstone is by rubbing the parallel sides of the crystal you possess, for at least 15 minutes a day. Doing this, you will ensure the strengthening of your nervous system, which will keep your head clear and your entire body functioning properly. If you have heart or blood pressure problems, tourmaline will also help in regulating your blood flow and heart rhythm. Not all tourmaline gems have the same healing properties. Black tourmaline, for example, deals with your emotional health problems, while verdelite helps fortify your nervous system. For your heart, you should consider a rubellite or a watermelon tourmaline. Eyesight problems should worry you no more if you will use an indicolite. The tourmaline birthstone can also be used as an air purifier, due to its electromagnetic properties. These gemstones create negative ions that aid in the removal of dust or other impurities that can be breathed in. All energy centers or chakras can benefit from having a tourmaline gem around. It will help open your third eye while at the same time it will align your energy centers so that you feel more energized and balanced. Black tourmaline will keep away all those feelings of anger, resentment, malice, and even help with the green-eyed monster. Watermelon tourmaline gracefully combines subtle shades of green and pink. If attracting love is what you have in mind, then try this version of the gemstone. Verdelite sports deep nuances of green and can help you counterbalance a lack of creativity. Indicolite will turn any October-born into a psychic as long as he or she has gazed long enough into the azure color of this gem. Rubellite’s colors can range from pale pink to rich red. Passion or vigor can be restored to you with the use of this gem. There are a few things to consider when buying tourmaline gemstones. As with many other semi-precious stones, you should check its color and hardness, but also its refractive powers or luster. When selecting a tourmaline ring, bracelet, or a pair of earrings, you can choose from a number of colors. Green tourmalines appear as less flawed to the naked eye. This one of the reasons for which they are quite popular for jewelry-making. You can choose from pastel greens to more vibrant hues. Chrome tourmalines are only found in a small region of the African continent, making them quite rare. Their color is quite similar to that of the emerald. Blue tourmalines or indicolites can be quite similar to sapphires and can be a great replacement. You can also find them in hues that are closer to a turquoise shade. 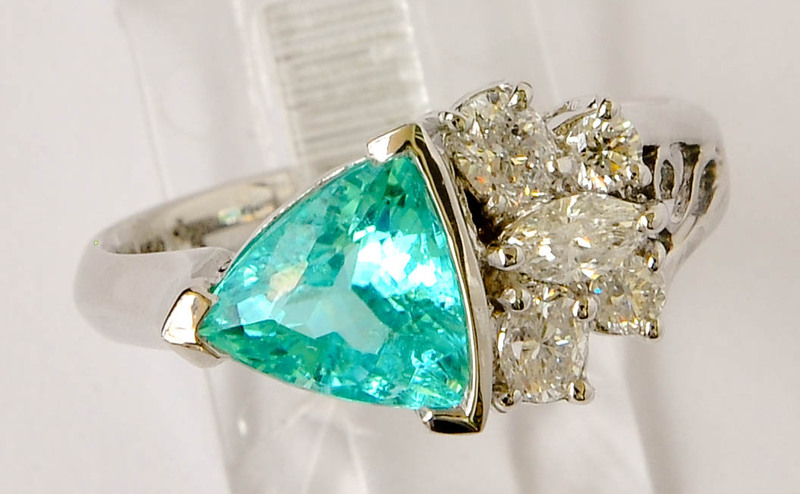 Paraiba tourmalines are one of the best-valued gemstones in the world. They are extracted from Brazil and have a neon green or blue color. The Paraiba tourmaline is the only tourmaline to contain gold, which makes its retail price reach the staggering value of $10,000 – $20,000 per karat. Red tourmalines or rubellites that have little flaws are highly valued. A clean rubellite can be quite expensive and rare. Multicolored tourmalines are not so rare, but they offer a beautiful spectacle in any jewelry cast. Watermelon tourmalines will remind you of the sweet taste of a refreshing drink on a hot summer day. A tourmaline is considered to be a watermelon one if it has green and red hues separated by a white stripe. It can be quite hard to find a perfect watermelon tourmaline, which makes this gem a real treasure to have, even though not a very valuable one in terms of pricing. A tourmaline gem makes you a privileged person. Few people can enjoy the spiritual benefits of such a beautiful and unique stone. Any jewelry item comprising a tourmaline will surely make everyone jealous of your possession. There are, of course, many other powerful gems waiting to be discovered. Good luck! Hey Buddy!, I found this information for you: "Tourmaline: Meaning and Healing Properties". Here is the website link: https://accessgems.com/tourmaline-birthstone/. Thank you.